Our product OnePCR™ Reaction Mixture (ABIN2868533) is a ready-to-use PCR reaction mix containing all relevant reagents for a quick and efficient PCR. With the simple addition of primers and template the OnePCR™ premix is suitable for a wide variety of DNA amplification techniques ranging from PCR screening to primer extension and RT-PCR. Novel Green is a next-generation DNA-binding dye with features ideal for use in both PCR and quantitative real-time PCR. It is excited by blue light at 497nm and in the UV range. Thus, it is possible to visualize PCR products synthesized using OnePCR™ on a UV transilluminator but also the lower using lower energy blue light to prevent DNA breakage. Upon binding to DNA, Novel Green fluoresces at 524nm in the visual light range for easy detection. Our Taq DNA polymerase is an highly processive 5' -> 3' DNA polymerase with 5' -> 3' exonuclease activity. 3' -> 5' exonuclease activity lacks. It has been purified from an E. coli strain carrying Taq DNA polymerase overproducing plasmid. Ready-to-use mixture. Simply add primers and template. Contains Novel Green Fluorescence Dye. 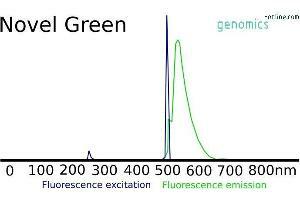 Visualization of PCR products using lower energy blue light possible. Unbeatable price: only 22$ for 100 tests. Order our OnePCR Reaction Mixture and try it. In case of any question our customer support will gladly help you via live chat, email or phone. See product details.